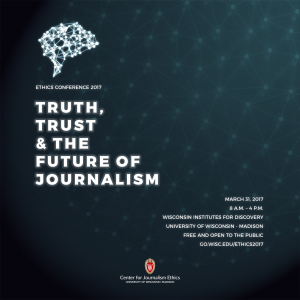 Truth, Trust and the Future of Journalism brought together more than 200 journalists, scholars, advocates and community members to discuss how we have gotten to historically low levels of trust in news media and how we can ensure a free, courageous and responsible press in times of extreme partisanship. 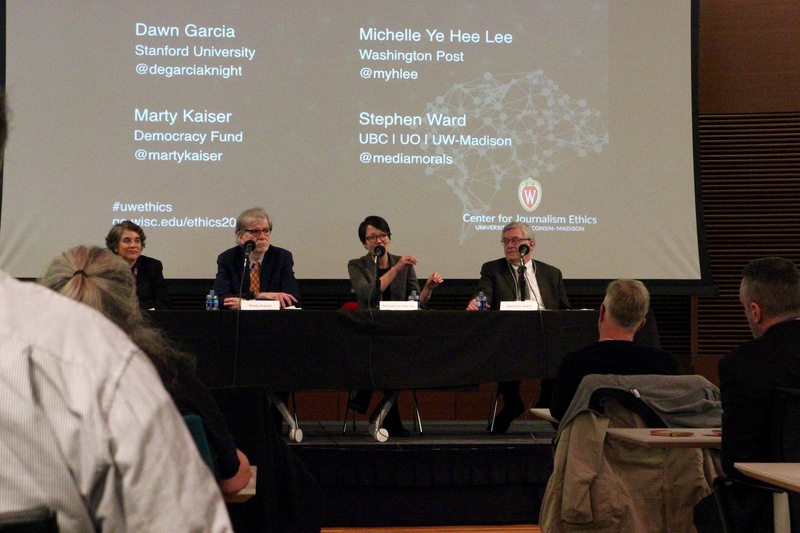 The Center for Journalism Ethics’ annual conference focused on critical issues facing journalism today: fake news, conspiracy theories, disinformation, public mistrust and possible solutions in what some are calling a “post-truth” era. The Washington Post’s media columnist Margaret Sullivan served as the keynote speaker, kicking off the conference with a Q & A with CJE director Katy Culver. 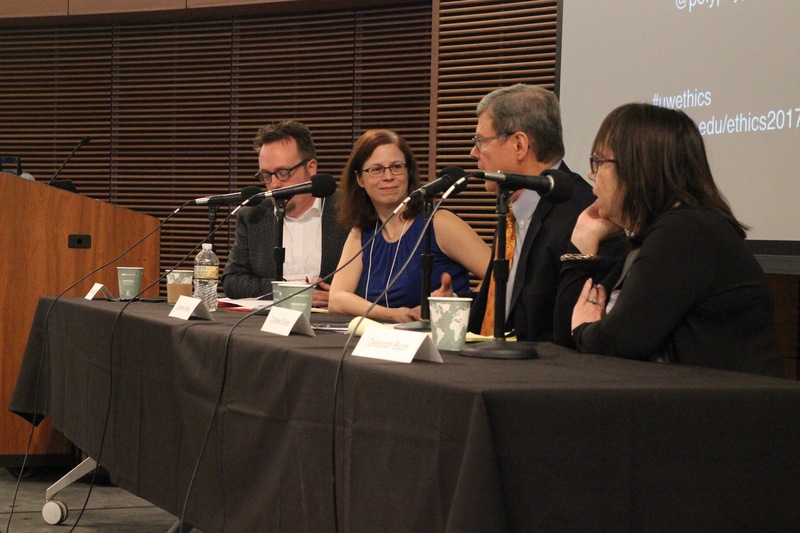 Discussion spanned everything from the news balance of the last election cycle, to the value of the term “fake news,” to discussion of Sullivan’s previous role as Public Editor at The New York Times. 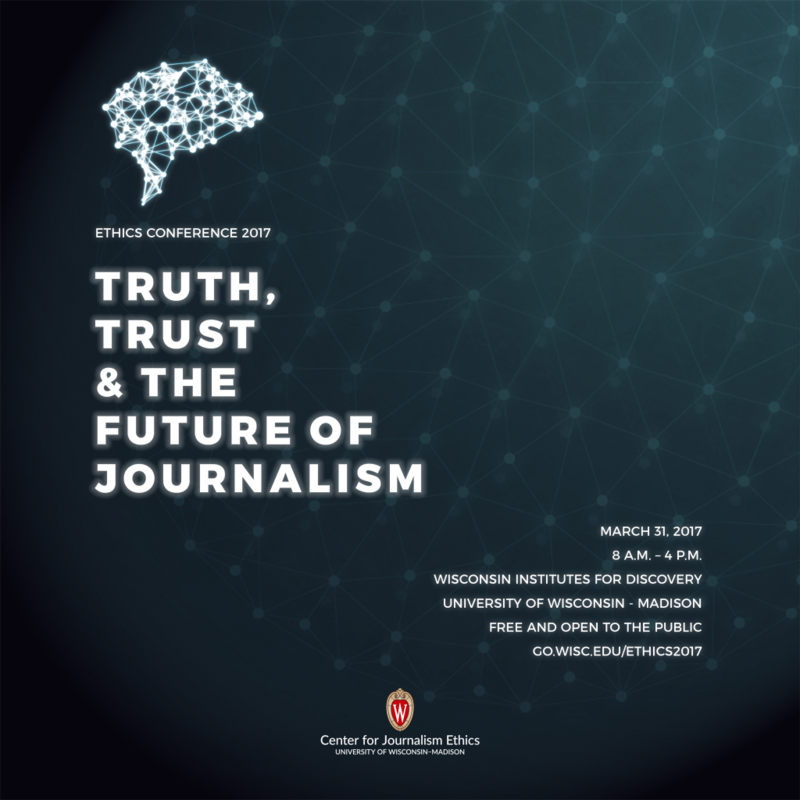 Ken Vogel of Politico addressed the concern over major news organizations’ reliance on confidential sources. 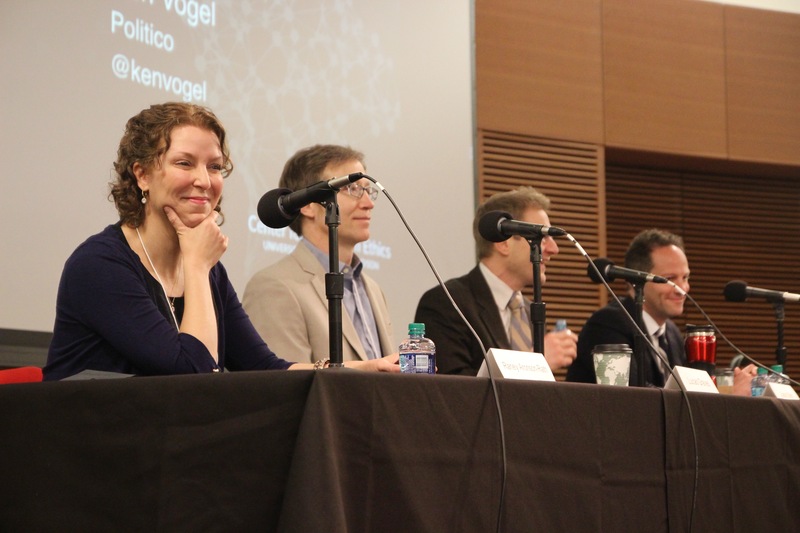 Vogel noted the importance of those relationships in reporting, but also said he thinks the best journalism happens when journalists are digging up information themselves, rather than working their insider sources. 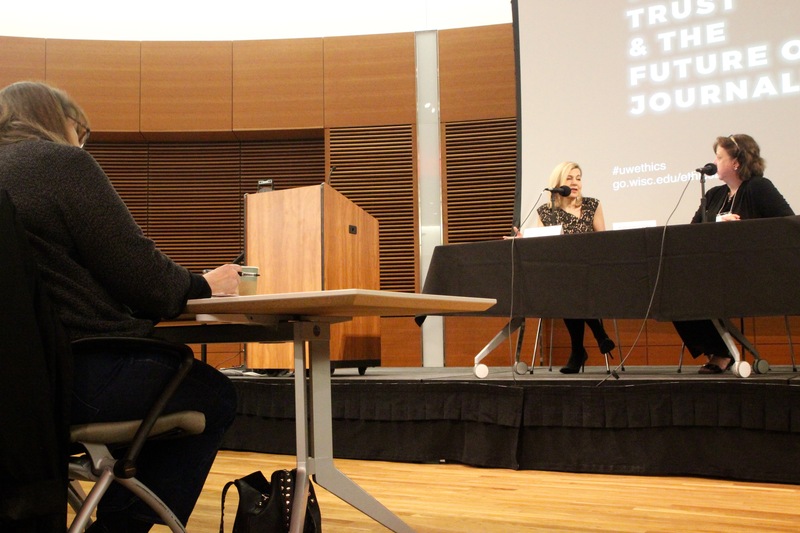 In response to comments that much of the coverage surrounding Donald Trump is negative, UW journalism professor Lucas Graves Graves said reality is not always balanced, pointing to the industry emphasis on fact checking as an example that fair isn’t always balanced. Joanne Miller, a professor of political science at the University of Minnesota, also criticized the notion that we’re living in a post-truth era. She explained that human reasoning is not developed to identify the truth but rather to ensure our survival. She researchers what she calls a phenomena of losing side psychology: When a highly knowledgeable individual’s political party loses an election, she explained, they may become more distrustful of media and political institutions and become predisposed to believe conspiracy theories in an attempt to rationalize the loss. How to build back public trust was a point of debate between Deborah Blum, a professor in MIT’s science writing program, and Charlie Sykes, a prominent conservative talk show host. In recent years, Blum noted how science journalism has shifted to reporting the narrative supported by overwhelming scientific evidence, rather than giving equal balance to two sides, citing the Los Angels Times‘ decision to eliminate Op Eds rejecting climate change as one example. But Sykes warned that it’s when there isn’t space for these discussions in mainstream media that people turn to alternative outlets like the Breitbart News Network where they can find content that validates their worldviews, leading to further fragmentation and mistrust. Michelle Ye Hee Lee of The Washington Post’s Fact Checker said she is a proponent of bringing fact checks to the audience in the spaces they’re already in. Lee said presenting fact-checks via Snapchat has been a successful tactic to reach younger audiences. She added that the Post’s fact-checking newsletter is the organization’s fastest growing newsletter as well, growing organically between reader shares. Lee’s takeaway? Be creative and reach people where they are – don’t expect them to find you. At Stanford University, Dawn Garcia said Knight fellows are innovating solutions to major issues in journalism, addressing everything from challenges with data journalism, emerging technology, audience engagement and diversity, news ecosystems and business models. Current journalism business models were of concern to Marty Kaiser, Senior Fellow of the Democracy Fellow, as well. But he said he sees hope in the changes he sees newsrooms making in response to financial pressures.